Lawn care in Reston, VA is something Green Hill Landscaping takes seriously. 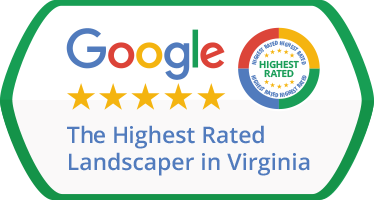 We’ve been in the lawn care business for many years and our family-owned business is something we take great pride in! Today we’re going to tell you about core aeration and why it is important to the health and beauty of your lawn. Anyone can tell you that a healthy lawn is a beautiful lawn, but in order to achieve a healthy lawn you will need to do much more than mowing, watering and fertilizing it. You’ll need to ensure that the vitamins and nutrients in your water and treatments reach the soil that is under the grass. The lawn needs to breathe and compacted soil and thatch will prevent your lawn from breathing properly. This translates into dry grass and an unattractive and unhealthy lawn. Aeration, or the perforation of the soil, ensures that this does not happen; it ensures that air and water get to the roots of all your plants and grass. To be more precise, the main reason why your lawn, why any lawn, needs aeration is to alleviate soil compaction. These types of compacted soils have solid particles which make it hard for the air and water to seep in and feed the root of the plants and grass. A thick and healthy lawn is always a result of core aeration! If your lawn has a spongy feel and also dries out easily. This could very well mean that your lawn has a thatch problem. You should go and check this out: do it by grabbing a shovel and remove a four-inch deep slice of your lawn. Is the thatch layer larger than one-half inch? If it is, you need to do some aeration! If your lawn is heavily used, then you need to do it! Especially if you have kids and pets running around on it often. If your lawn has soil layering; this means that there is soil of a finer texture layered over coarser soil that prevents the water from reaching the lower layers and the roots. 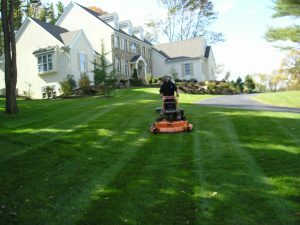 If you are interested in becoming our customer, you should know that aside from Aeration & Overseeding, we also do Lawn Mowing, Weed Control & Fertilization, Spring Mulching, Seasonal Flowers, Bed Weeding, Seasonal Pruning, Plant & Shrub Care, Fall Mulching, Aeration & Overseeding, Gutter Cleaning, Fall Leaf Clean Up, Winter Clean Up, Snow Removal, Irrigation Service, Mosquito Control, Insect Control: Ant, Flea & Tick Treatment, Landscape Lighting, Commercial Services, and more! Leave lawn care Reston, VA in our experienced hands and we will transform your lawn into a picture perfect lawn. Fill out our Free Estimate Form for Lawn Care Services in Reston, VA or call us at 703-327-3271.